Question of the Day: Do You Trust Your ATM? I was reading a funny little post over at stopbuyingcrap.com on the horror stories of depositing cash into ATMs. The author had actually worked in the check processing department where ATM deposits were processed and the funds added to your account. My point is, with all these security, precaution, screening of employee, rules and regulationâ€”mistakes do happen. People are not perfect. While itâ€™s less of a chance that someone will steal your money in the cash vault department than at the local branch, it DOES happen. Urban myth of deposited cash stolen from ATM? Think again. Ever since his experiences working there he has always been nervous about depositing cash into ATMs – and I have to agree 100%. There’s just something about giving a machine money that doesn’t sit right with me – so if I ever have cash to deposit I go directly to the teller. He goes a step further, however, and uses a teller when depositing larger checks as well. I’m not sure that I would go that far but if you feel nervous about using ATM machines for cash or check deposits then Wells Fargo has the answer for you. Wells Fargo is converting 400 of its ATMs in California to digital imaging technology, eliminating deposit envelopes and paper checks. The new system, WebATM, has been piloted since 2002 and allows up to 30 bills and 10 checks to be inserted simultaneously. Assurance of received deposits is provided via check images on screen and on the customer’s receipt. WebATM also provides instant credit for cash deposits, with funds immediately credited to the customer’s account. The deposit cut-off time has also been extended from 4pm to 7pm on weekdays, giving customers same-day credit for deposits outside banks’ opening hours. 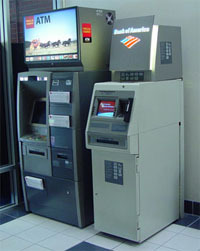 Wells Fargo expects the envelope-free WebATM machines to be up and running by the end of 2006. Oh, be sure to vote in the poll below! It’s not much of a “question of the day” if nobody answers the question!